Iris and Calypso are beautifully designed two level villas on a hillside overlooking a harbor of small boats, a simple beach side resort, hills to right and left, and across the water hills and mountain of St Kitts. Over all is the sea and sky, wonderfully changing thru the day. Swimming beach is a short walk down a steep hill. Iris, (upper level) where we stayed for 8 days, has a wide covered verandah with large table at which we ate all our meals. (Calypso is larger than Iris). Sunsets were spectacular! The apartment is airy with screened sliding doors and large windows -- we hardly used the ceiling fans. The king bed was more comfy than at home! Kitchen has all necessary cooking and eating ware. Nevis is a true gem -- peaceful and relaxed. We completely relaxed and loved our stay and will return hopefully next year. Luisa and Joe, Boston, Massachusetts. Brilliant... That view is a 'killer'! PS: Monkeys were great also. We had a great stay at Villa Calypso and we hope to be back sometime soon! The views from the large wrap-around deck are beautiful. We enjoyed coffee here each morning and rum punches at sunset. You can easily walk down to Oualie Beach to swim, go to the restaurant, or to catch the water taxi. You also can walk to Lover's Beach which was great for swimming. Upper Calypso was spacious and had everything we needed for a nice stay. The pool was great too. Thank you very much for your hospitality! Comfortable house and wonderful views -- what else do you need for happy vacation?! We stayed in the Upper Calypso for 10 days. It was the perfect spot for 2 couples and the villa was the perfect combination of a fabulous view, privacy, and convience. Great location if like us, you are diving through Oualie beach as just a short walk. We also hiked Mount Nevis and the waterfall trail which were great for hikers. Nevis and the Calypso/Iris Villas are a jewel in Paradise! Not long enough for the fearless Dogfish Swim Team. We participated in the Nevis Channel swim. Our accomodations were perfect for Bruce & Beth / John & Ann / Jeff & Shelly and Dr. Jim & daughter Chandler. 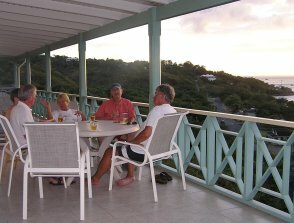 The veranda overlooking the bay was a wonderful spot for us all to have coffee in the morning and drinks and a sunset in the evening. Truly a wonderful spot for all of us to relax and enjoy our friendship. As the wind prevented us from the actual channel crossing, the swim along the coast was spectacular. We will have to return to Nevis in the future to attempt the crossing. Thanks again for a wonderful place. Just one week in Paradise was too short!!! We will remember this paraisiac island a long time. It was so quiet and splendid. No cruises, no stress just clear water, a lot of sun, friendly people, good organic food (fresh and tasty). We hope to be back. Another lovely year (our 9th)! We feel fortunate to have been here while New England was dealing with all the snow and cold weather. We've made many friends on the island, and Iris feels like a second home. We were here in 2009 and now we are back! The occasion is Hugh and Mary's 25th Wedding Anniversary and now the whole family has come back to Nevis (they had their honeymoon on St. Kitts and Nevis 25 years ago!) to celebrate. We have had a wonderful week. We swam at Oualie + Lovers + Pinneys and drove around the island. We visited St. Kitts and Charlestown. 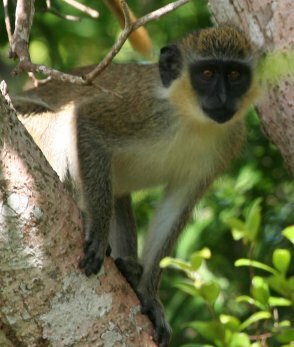 We also had many monkey sightings & great dips in the pool! We love this place. the view is absolutely perfect and the place is so incredibly peaceful. January 10, 2015 We are off today, having spent an amzing 10 days here at Iris. Lovely time... Our favorite highlights were the Hermitage hog roast buffet -- a colonial experience stepping back in time (pricey though). We loved Nesbit Beach and Christshi Beach run by a Norvegian couple and our preferrd restaurant was Bananas! PS. 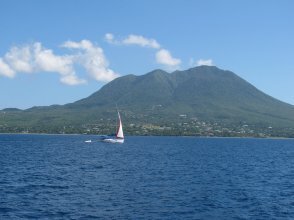 If you like sailing, contact Miles at Nevis Yacht Charters - awesome! This was our first visit to Nevis and were close to booking in at one of the many hotels, when we came across Upper Iris whilst looking for an alternative self catering option on Google, and very pleased we did. Upper Iris sits just above the Oualie Beach hotel, but with far superior views. We were met off the water taxi by Urban the very helpful property manager, who took us up the hill in his 4x4, showed us how everything worked, and gave us his number in case there was anything we needed whilst there. It was great having a large well equipped kitchen to ourselves and although we ate out quite a bit, we really enjoyed making our own breakfast with fresh fruit from the supermarket and sitting out on the spacious veranda, enjoying the fabulous views across the water to St Kitts and the mountains. The fridge was huge, so also great for storing our wine and G & T for pre-dinner drinks, without having to rely on hotels or bars all the time. So yes, Upper Iris was certainly a great choice for us, and we loved the freedom of being able to do our own thing and not being surrounded by umpteen other tourists. We hired a perfectly good car from Strikers (Suzuki) and had a great time exploring the Island, along with all its amazing history. Apart from just going 'to the beach', we highly recommend lunch or dinner at Golden Rock, Montpelier Plantation (amazing Lobster sandwich), Bananas, and for a special treat you must try the Pig Roast buffet at the Hermitage Plantation Inn on Wednesday evenings - very colonial and just incredible. As for the beach, we loved Nisbet Plantation for its big waves, diving Pelicans, and a super beach side restaurant with a mouth watering menu. We also really enjoyed Chrishi Beach restaurant on Pinney's Beach, owned by a Norwegian couple who sell the tastiest burgers in the world (in my view), have a great wine list, along with double beach beds! Oualie beach also good for swimming, and for our final bit of indulgence we chartered a private yacht to celebrate Jane's special birthday and spent four magical hours sailing the waters around St Kitts, with the boat's owner Miles from Nevis Yacht Charters - worth every penny or dime. We are on our honeymoon and will never forget this beautiful time at the Calypso villa and the island of Nevis. Kyle and I are blessed to have found true love with one another and celebrating God's goodness to us on this island was a special bonus. Thank you for your hospitality and the wonderful home away from home... in paradise. Well, what can we say? What a fab villa! Wonderful views, well equipped. We had a brilliant time visiting family and staying here. Horse riding was brilliant! Will definitely be back and hope to stay here again. Martin Courtney and Kelly Maynara, Coventry, England. Absolutely fantastic holiday with friends and family. The villa and the island were amazing, the views every day were stunning, even in the rain. Thank you. A wonderful time was had by all. Perfect villa, wonderful views, lovely people! Ice cold Carib... Delicious! Thank you. My family and I spent the Holidays in Nevis this year. We stayed at the Calypso and it was WONDERFUL. The house was even more beautiful than the picture of it. It was clean, spacious, comfortable and the owners took much care in providing everything that they can think of to make our visit just about perfect. OH! and the view......in a nutshell AWESOME. I loved sitting on the veranda and just gazed at the ocean and the sister island of St Kitts while the monkeys played in the trees. The Calypso is located across from Qualie Beach and less from a mile from Lovers Beach but if you dont want to go to the beach there is a pool on the property. The property manager checks in to make sure that all is well and is very helpful answering any questions you may have. This is a place that we would most definitely use again and would recommend it to anyone. Our 8th year in Iris has been as pleasant as all the others. (This year had the added benefit of very few mosquitoes.) We spent a lot of time jus reading and relaxing on the verandah. The island continues to change, but Iris remains a lovely sanctuary. November 2 - December 22, 2013 Hello, again. 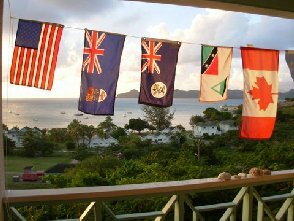 We (Richard and Liz) are saddened ro leave our favorite "Iris" Villa, island of nevis and wonderfulfolks, neighbours and friends - 7 weeks pass too quickly. Many thanks to Gary for the ne (big) TV, refrigerator, washer and dryer and ...great pool and patio lounge chairs. The weather, while unsettled (even two-day "tropical depression" -- lightning, winds, and gulley washer rains -- didn't hinder our activities) still met our criteria for a perfect holiday in the tropics. To all who follow - enjoy! Cheers, Richard and Liz, Sidney, B.C., Canada - on Vancouver Island. As this was our second stay at the Calypso/Iris villa property, I might be faulted by repeating myself as it pertains to our repeat and complete enjoyment of the one bedroom suite of the Upper Iris villa. A review written after our last year's visit covers our delight with the facility, staff and location. Rather than a 6 week stay on roughly the same dates in 2012, we chose 7 weeks this year. Upper Iris was again found to be clean, comfortable, fully equipped and gave us a feeling of returning home. A pleasant surprise was finding a new, large, flat screen TV in the bedroom to augment the smaller one in the living room. Further, the new refrigerator/freezer had replaced an older, less energy efficient model and in the villa's shared laundry room were new, high efficiency clothes washer and dryer. I am purposely reiterating that electrical energy is very expensive on Nevis. Even though Gary has equipped the units with excellent appliances we encourage all who visit to minimalize the use of, particularly, the dishwasher and the clothes dryer. Because we enjoy cooking, I was happy to find Gary's very healthy basil plants� just another highlight of a perfect tropical retreat on our favourite Caribbean island. We loved Nevis! Calypso suited our needs very well! - the location was excellent (my cousin and her husband live at Cliffdwellers and they lent us their car for driving back and forth) the bedroom layout is great for two couples, and we just loved the veranda for breakfasts and watching monkeys, birds and sunsets! The pool was great for a refreshing dip before heading to dinner. My cousin was a chef in a previous life and she hosted us each evening! Some fun things we did included hiking to the source, visiting some ruins, lunch at the Golden Rock plantation, lovers beach, windward beach, Pinney beach and a snorkeling excursion around Cliff Dwellers (the only worthwhile spot according to my cousin. Although we had little contact, Urban was very friendly and willing to be of help, Claudo and the couple in the other unit were friendly and quiet. Thanks again for all your help and the use of your home! -Been shopping and to the market several times. -Snorkelled at Herbert's Beach (our only disappointment, not much snorkelling here) and Jim went on 1 snorkel trip to St. Kitts. We are having a fantastic time and love Villa Calypso which has currently been christened the Princess Palace as the girls feel so very lucky to have such a lovely palatial yet homely place to spend Christmas. The girls are out cycling at the moment and the smaller children are just back from the pool which they are loving. Elizabeth and Bob Frearson, Bishops Cannings, Devizes, U.K. This is our 4th visit to Nevis over the past eight years, each time staying a month or more. On three other occasions, we rented other small villas in the Oualie area but there is no comparison with the delights, comforts and benefits of Upper Iris. We couldn't be happier with our six-week stay. Dealing directly with the owners couldn't have been easier. Our flexible travel plans fitted flawlessly with the six-week availability of Upper Iris. The Upper Iris unit can best be described as part of an up-down duplex building with the lower area usually rented, long term, to a university professor. (In our case, seldom seen or heard.) Similarly, and separated by the pool and grounds is the neighbouring, larger, Calypso building. It is also an up-down situation but available for larger parties on one or both levels. The upper units are well furnished and provide all the modern conveniences of a North American home. Urban Jones, property manager, addressed any of the very few small problems quickly. This was emblematic of the cleanliness and liveability of Upper Iris. A quick stroll (5 minutes at most) down the hill delivers a resident to Oualie Beach and its hotel, dining room and bar, plus a myriad of providers of island/ocean activities. A calm and sandy beach at Oualie is ideal for kids. Close-by beaches are perfect for long walks, swimming and just limin'. We self-cater but do enjoy the odd evening out at the many very good eateries close at hand. I'm almost reluctant to recommend Calypso/Iris as we felt so privileged to enjoy our stay and look forward to staying again... being selfish, perhaps, not to have anyonee else interfere with our next visit. Never-the-less, we highly recommend the entire complex: for a couple in Upper Iris and/or a family/group of up to 12 in the Calypso building. 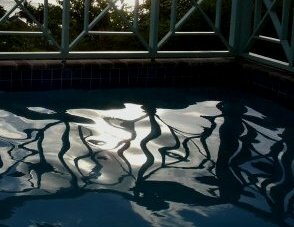 My only caveat would be that young children would have to be closely watched around the pool... although more than an adequate plunnge pool, it is deeper than most. If anyone reading this has any questions, please ask the owner to refer you to my email address. Nevis is a place to return to... but you have to make the first visit to realize its ever-lasting attraction. Jan 8 - March 21, 2012 Six years in iris and we still enjoy it as mich as we did when we started staying here. Lots of rain this year so the foliage is lush; beautiful sunsets and a few green flashes. We have enjoyed reading and relaxing on the verandah. Looking forward to next year. Many thanks for making available your delightfully-sited Calypso Villa, roomy and practical for our family of 6 with breathtaking views of the harbour. Nevis is fantastically serene compared to St. Kitts. And we often found ourselves on deserted stretches of sand at Lover's Beach and Paradise. We loved the steep mountain climb up Mount Nevis with local guide Sheldon, recommended to us by the folks at the exquisite Hermitage Plantation Inn where we often enjoyed late afternoon Pina Coladas, renting bikes from the elegant Wilson down at Oualie Beach and scavenging for sea fans, sponges and historic clay pot shards on Coconut Beach. 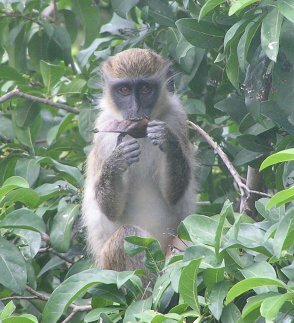 The vervet Monkeys offered endless entertainment. Memorable meals beachside under thatched roof of the Double Deuce, or at the Golden Rock and Mount Nevis Hotel. We plan to come back! 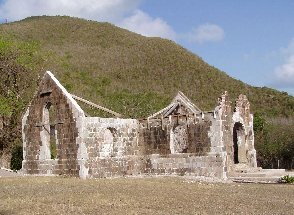 Meanwhile, here's the link to my blog, including a post about Nevis: chasinghome.org. This is our 5th year in Iris, and it has been as delightful as all the others. It's difficult to think about leaving the island. Maybe next year we'll stay a little longer. As regulars to Nevis for the last five years me and my wife enjoyed the visit again, as always. What a difference a villa makes. Having passed this area and Calypso villa so many times before we decided to book it and didn't regret it. 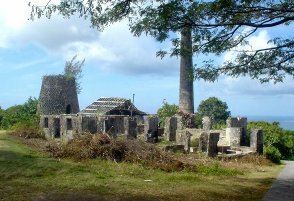 We hope Nevis will keep its past and present spirit, continue to develop gradually and will not become victim of over ambitious property developers and politicians. Keep our warm and genuine Nevis for many years to come. Hope to be back soon. We have been to Nevis many times, and have stayed in a few different places, We can honestly say that staying in Calypso Villa made our holiday extra special because of all the 'home comforts', we had everything we needed, and the views were spectacular! Thank you for everything, and please thank Urban for agreeing to drop us at the Sea Bridge Ferry. We will contact you again to see if the Villa is available for our next visit. Hope you have a wonderful Christmas and New Year. We really had a great time! It is a wonderful place - both your house and the island! We had terrific weather too. We went to dinner at Miss Junes one evening - what an interesting woman. She said that if she had known it was my birthday, she would have decorated and invited more people. We also ate at the resort across the street a few times - very nice people there! If I get a chance to go back to Nevis, or have friends planning a vacation, I'll be in touch. Thank you and Happy Thanksgiving to you, too. My 50th on Nevis! What a great experience with 7 of my dearest friends. Lyn was our guide for our hike and Coby took us snorkeling. Miss June is not to be missed -- but really -- don't eat all day and plan to stay past midnight. Steve & Hillary are great cab drivers -- including to and from Miss June's! We hope to come back -- soon! Oh -- and let Jim and Marcela take care of you over at Oualie Bay Resort for dinner, breakfast, drinks, etc. Have fun! Dear Maria - we just got back to Bath, having stopped off in Paris then London. We all had a marvellous time and really enjoyed our stay in your comfortable and very well-equipped apartments; this was the holiday-never-to-forget that I wanted our 7 grandchildren to have, and it certainly was. As I think I told you, my wife was born in Montserrat - and cousin of the late Nevis artist Eva Wilkin - and although she doesn't want to see Montserrat in its ravaged state it was a happy chance that the trusty (?!) Sea-Hustler was going there on a day-trip on Easter Monday, so the grandchildren at least got to visit. 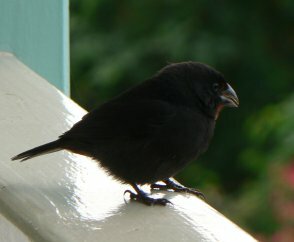 We also had a personal steel-band concert on the verandah, which delighted your English neighbour, Jerry. As you could probably tell from the rather brusque enquiry sent from Guadeloupe, the family were concerned about sleeping arrangements since it was rather cramped in the French villa, but they all fitted-in perfectly well, as you assured me. The setting and sunset view from your terraces is splendid, and we congratulated Urban on his building skills; I pointed out damage to a door screen at Iris (a child failed to realize it was there) but he assured me it would be no problem for him to fix... I hope so. It was a charming touch to have vases of Bougainvillea to greet us in each apartment. I wanted our grandchildren -- 8 to 15 -- to experience something of my wife's W. Indian (Montserrat) background, and they have loved it here -- as can be seen from their comments in "Iris". So have I, and what a perfect spot. A happy encounter on the last night before our 13-strong family departed (end of half-term holidays!) bought Charles "Babathuji" Moore and his steel drum to perform on the verandah: memorable! Felix & Lilian Moore, Bath, England. We had a really nice time in the villa. I really enjoyed it! All 7 of the Moore/Bowdler kids staying in Iris had an amazing time. The view was amazing, watching sun go down with a steel band playing was magical. I'm definitely saving up for a trip here again. I will never forget my time here and the experience has been phenomenal. We had an amazing time here in Iris. I hope we come back again. My name is Iris so I quite like staying in my own villa. I really enjoyed the experience. Even though Nevis is a small island you can have loads of fun! What a lovely island Nevis is. And this is the nicest spot. 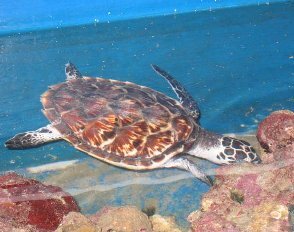 Shell- hunting on Pinney's Beach; lobster at the Gallipot; having Lovers Beach all to ourselves; a day trip to Montserrat; Charles "Babathuji" More the steel drum player coming here for a private gig; rum; seeing the Green Flash (yes, I'm a believer). And the pool was just right for cooling off in. A perfect spot: have accommodated a family group of 15 with comfort. Children really loved having their own houses & the monkeys. View unrivalled. Wonderful holiday: but too short! Last came to Nevis when I was 10 & lovely to give children same experience. Amazing experience! Lovely weather; beautiful beaches; just perfect! It was great here, having lovely villas and a brilliant setting all at once! I can't wait to tell my friends all about it when I get back to England! To sum up my time here, I just had to use one word -- FANTASTIC!!! I was born and brought up in Montserrat (my family having lived there for 4(?) generations. So I just had to bring all seven of my grandchildren -- to see my roots -- but of course I couldn't go with them for the day there -- too painful for me. But they loved it as they did the week here. I found this place perfect too. I shall keep it as a happy, happy memory back in cold England - Bath. I soaked my arthritic knew in the Nevis "Bath" hot springs. Good luck to villas Iris & Calypso. The six of us had a great time in Calypso. It was very confortable and well furnished. We really enjoyed the island it has become one of our favorites to return. We sure enjoyed watching the monkeys ever morning, the hiking, snorkeling, golfing at Cat Gaught and the wonderful restaurants. I've attached a couple of pictures for your use. We were last on Nevis 20 years ago for our honey moon. We stayed on St.Kitts but came over for the day and loved it. So here we are now, 20 year later back on Nevis with our four children and we have had a fantastic time. We loved lover's beach - the kids had a wonderful time playing in the waves. The view is phenomenal, and we loves the monkeys! They visited us a couple of times! We enjoyed our rainforest hike with Jim Johnson and our snorkel with Barbara from Under The Sea. Aladin was also a big hit. We had a great day trip to St.Kitts! Thanks for sharing your lovely villa with us. We'll be back (we hope) soon! PS. We agree that it's even nicer then the photos. What a view! We are currently at your fabulous villa in Nevis and we are having a great time. Thank you so much for letting us stay at your place. I have a question about our check out on Thursday. Is there someone else checking in that day? If not, would it be possible to check out around 2 or 3 pm? 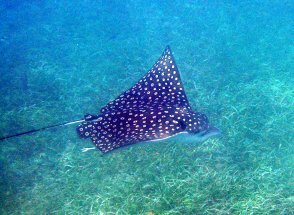 The reason being that me and my wife would like to do a couple of extra dives with Ellis at Scuba Safaris on Thursday before going to St. Kitts for the remainder of our trip. It's not a big deal but it would be highly appreciated. Another lovely two months in Iris have come and gone. Sitting on the verandah enjoying the beautiful scenery is one of our greatest pleasures. This year we saw the green flash! Even now we're looking forward to our return. '08 XMas / New years. We have again enjoyed the views, walks, bike rides, shopping, cooking, swimming, exploring, relaxing, connecting, fishing, windsurfing, scuba, kayaking, snorkeling, turtles, stingrays, monkeys, goats, cows, kittens + mama cat, pelicans hunting, local venues + experiences, bite scratching, climbing to Source at Nevis Peak, hot springs/bath in town, Sunshines, Montpellier. Hope to return in 2 years !?! I was going to e-mail you as soon as I�d downloaded our photos, as we took lots of the gorgeous view from Calypso which we thought may be useful for your website.... Sorry it�s taken me a few days � we had problems with ALL our 4 cameras!! We had a marvellous stay at your beautiful villa. It really is SO well equipped, and also very practical as well as being relaxing and very spacious. It was very kind of Urban to put some things in the fridge for us when we arrived, and great to find basics like rice and pasta there, as we did not get a car at first. It was great to have the pool there � Louis spent lots of time in it. We loved occasionally seeing the families of monkeys in the garden from your balcony, especially a mother and baby. 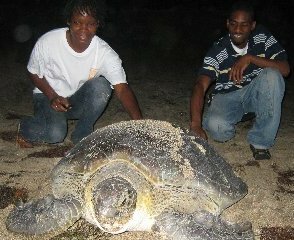 We also went on a turtle walk one night with conservationist Lemmy, and saw 3 massive turtles, and watched the Hawksbill and the green one laying eggs then walking down to the sea at Lovers Beach. 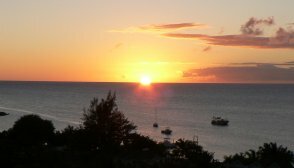 We also liked being close to Oualie beach and resort, as it�s a very friendly low key resort. The dive /snorkelling set up nearby is great � highly recommended. We also loved Herbert�s beach, so close to Nisbet but virtually deserted � paradise! We loved all of Nevis. 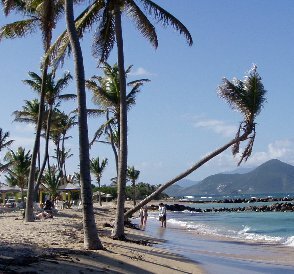 We�ve been to at least 4 other Caribbean islands but think Nevis is certainly the friendliest and can match the scenery and wildlife of all the others. 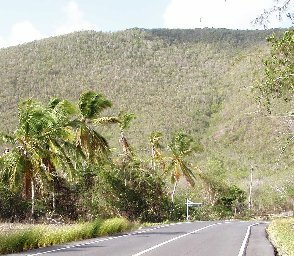 It�s really easy to get from St Kitts� airport to the villa (we�d been put off by the fact there were no direct flights to Nevis when thinking about visiting before). We got Seamoss taxi, then Seabrat water taxi across straight to Oualie, which is more expensive than the ferry but much more direct and it allowed us to spend 3 more precious hours on the beach on our last day. If you would like to put any of these comments on your website, or would like to post something on �tripadvisor� you are most welcome! We would like to come back when money permits, and will be recommending your villa to our friends. Does it get booked up very quickly in the high season? I will email you the images of the view etc if they come out ok, or I could post you a disc? We thought the view was even better in real life than in the pic on your website as all the foliage has grown up quite a bit now so you see less of the road. Golden Rock Plantation Inn (* closed end Aug - Nov for food) (as mentioned by other visitors). Lovely for lunch in very relaxing luck surroundings. Owners kindly let us use their lovely, contemporary swimming pool after lunch & we had it all to ourselves. One of the best pools I've ever been in. Lots of good hikes from here & lots of green monkeys around. Herbert's Beach Just past Lovers Beach & airport & past Nisbet Beach there's actually a sign pointing to Herbert's Beach, a very quiet silver sand beach with lots of palms & a long pole sticking out into the water which kept our son (& his dad!) amused for ages as he "walked the plank" & jumped into the sea. A good place for making friends with other "plank walkers" if anyone else is around. Very clear water & quite good for snorkeling too. Sorry for the delay in replying to your mail but we've been crazy busy. Thanks you so much we had a wonderful stay and the villa was just great nothing was lacking and you have a million dollar view. Next time we visit Nevis (and we will) we'll be sure to contact you first. We'll be recommending your villa and Nevis to all friends and family. We just wanted to let you know that we had a wonderful time at your Upper Calypso Villa. We honestly did not want to come home! It was absolutely lovely! You have a wonderful person taking care of the property, Urban was so nice to us! Thank you so much! We hope to return to your villa in the future! In the book at the Upper Calypso, we mentioned how amazed we were that the property was better than the pictures on the website! You never know booking online! We loved everything about it! We were pleasantly surprised that the villa Calypso was more beautiful than it looked on the website. You never know when looking online! We appreciated the special touches; fresh flowers were lovely. Urban is amazing! What a personality! It was fun watching the monkeys & birds from our balcony. just wanted to tell you what I am sure you hear over and over..your place is wonderful. So perfect for couples and families. We are so glad that we did also rent the lower Calypso when all six of us were there at the same time. Then what can you say about the breath taking view, the pool, the beach, the Islanders - etc., etc.... and of course Urban and the woman who comes to clean were so very nice. The fresh flowers and call from Urban upon our arrival were such a warm touch. I don't know how you ever leave there. Ha. Well, probably because like us you have to come back to work and reality. The people staying in Upper and Lower Iris were so friendly and we always felt so safe and comfortable at the house and anywhere we were on the Island. I could, of course, go on and on. I just can't get over how our friends were so lucky in finding your Villas to rent... that particular part of the Island, etc. When we took a drive around the Island our friends told us how they were close to renting something at the Nesbit Resort (I'm not sure I have the name quite right).. and then when my husband and I decided to come, it wasn't big enough and they chose your place. I am so glad... It was just perfect on Oualie Beach. I dream of a day when my husband and I can go back with our family... "A dreamer lives forever" right? Best wishes to you. Another beautiful day at Upper Calypso. I am sitting on the veranda this morning -- as we have done every morning since we arrived. The view is breathtaking. Today not a cloud in the sky -- perfect in every way except that we are packed & waiting for a taxi to take us home -- to a cold & snowy Michigan. 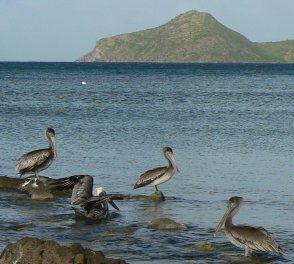 We are so glad to have discovered Nevis & Maria's wonderful place on the hill overlooking the water. Thank you for sharing it. Barry & Linda Pategdl had two weeks of this Paradise -- sharing the first week with Rick & Kathy Snyder -- finding all the great places to visit and eat. The Oualie Beach & the hotel are so perfectly convenient -- good food & entertainment at the hotel -- an awesome beach -- their week was highlighted when a sailboat ride with Miles & "G". Miles owns one of the boats we can see anchored out on the water -- they went on a 4 hour trip to St.Kitts to snorkel. Miles & "G" -- the perfect hosts & guides -- they strongly recommend this. Dinner at Gallipot was wonderful. The second week Snyders had left & Matt & Nancy Caid joined the Patgdls. 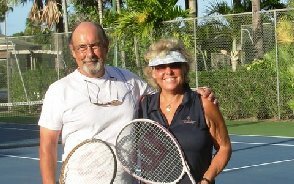 So how nice to spend Valentines Day in Nevis -- a perfect beach day -- dinner at Gallipot (try the grilled lobster) & back for nightcap & entertainment at the Hotel Bar. Sunshine Beach Bar -- very interesting. Shirley's a fun place to walk to out by Lovers Beach. Shopping in town was great. The monkeys -- cows -- goats etc -- were so fun to see. The neighbors in Upper & Lower Iris -- so very nice. And, of course, Urban made us feel very welcome -- and made us aware he was there for our every need -- the flowers -- fresh flowers -- were a very nice farm touch. We will treasure those memories forever. Just saying goodbye to Urban now. Thank you -- Barry & Linda, Kathy & Rick, Matt & Nancy. It's amazing how quickly two months have passed. We've thoroughly enjoyed our stay in Iris and hope to return for another two months next year. Merry Christmas and a Happy New Year for the 10 Ashe - McGilpin- Jackson-Craig family members who spent two+ weeks at Calypso. We were very lucky to be able to spend time together in such a wonderful setting. Good food, good times... we loved it all. Nice house. View for the ages. Highlights: bike ride around the island, snorkeling trip, sunrise walks, fox soccer, mutton stew and Urban Jones. Minor complaint... the friggin' mosquitoes should have license plates. We have had the glorious gift of staying at Calypso for the past 2 weeks. The view is nothing but incredible at all times of the day, even during the rain. Plenty of room for a family of ten and we loved walking the hill as many as 5 times a day. That's one way to keep the pounds at bay while feasting on the glorious foods & rum punches of Nevis! We loved to swim daily at Oualie Beach, but the trek around the corner to Lover's Beach was always worth the effort. We couldn't leave without many heartfelt thanks to Urban for his kindness & generosity. We leave you now as friends, no longer just visitors. Nevis is a very special island. Much love, peace and abundance in 2008 & beyond. This [Iris] is a wonderful place to stay on a beautiful island. Our first visit, but not the last. Iris/Calypso have some of the prettiest flowers anywhere; and a wonderfully private pool. Our adventures included a nigh drive to Bananas restaurant - watch out for the monkeys! Worth the trip. Also fun was Thursday night at Nisbet Plantation - very good food and reggae music.We also loved the Botanical garden - a magical place. Good food @ sunshines on Pinney's Beach, which is the best beach for a long walk. Best-tasting rum is Cavalier (Antigua) - the Belmont, made here, is poretty rough. Thank you, Calypso we have had 2 brilliant weeks here in Nevis the Calypso has provided us with all the home comforts. We came as a family of 13 and have had a brilliant time, we have stayed in the Iris + Calypso it is such a beautiful place the views are amazing from the Upper Calypso. We have seen plenty of monkeys in the trees outside the villa we have also seen a frog, plenty of lizards and after a heavy downpour of rain we saw a donkey spider (not for the weak hearted like me). We have also seen some very large caterpillars. While here we spent most of our time on Oualie beach or in the pool. We have visited Pinney�s beach -- Sunshine bar this is nice to listen to music & relax this has also been visited by plenty of famous people. We ate out at Coconut Grove although a little on the expensive side the service was 5 star they are so friendly. Also a big thank you to Urban Jones he was the perfect host, always there when you need him. �Thank You� we will definitely be coming back next year, so Calypso we will see you in the near future. Thanks. The Jones family -- from England, Sheffield. My family and I have traveled all the way from Sheffield, England. 13 of us in total, three generations. Some for the very first time. My wife and I have only managed to come here for one week, so we have stayed here in Iris. 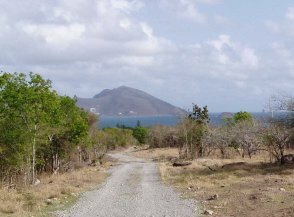 First impressions of the island: �Beautiful and tranquil.� From stepping off the plane in St. Kitts (the place my father Uriel aka �Fur� grew up) to getting on to the ferry to Nevis (the island my father was born on). The people we have met during our short stay here have been so friendly and so helpful. On our numerous car journeys around this lovely island, the honking of a friendly horn, and many, many waving of hands is something we from England are not familiar with. The Iris is somewhere I would really recommend to others in England and a place I would and will be coming back to, for much longer. Jerome and Rachel Jones, Sheffield, England. Only been here for one week but have really enjoyed our holiday -- quiet due to time of year. Weather has been great and we have found Iris to be very comfortable and convenient for the beach. Hello Calypso from the Walwyns, Sharrys, Mukwedeyas, Thompsons, Adams and Carrou! 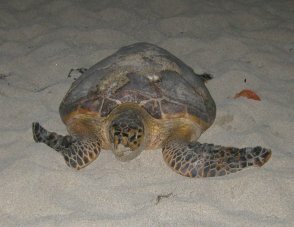 Calypso is well suited for our group which were nine adults and one child (9 months old Joshua). We really enjoyed our stay, as the weather, the view, and prompt management by Urban was excellent. Although we did not get to eat out much (as most places were closed) we were able to make great meals with the facilities. It was great to have Oualie Beach Hotel open for meals. We recommend an isalnd tour with �Teach� tours. A`rented car is a must to get around and Nevis Rentals gave the best price and and delivered the car wherever you wanted it to be. Although we are a family that some were born in Nevis, and others are offspring of the natives we love to visit and think it is a great place. Joshua (9 months) had a great time and the fans came in handy on the very hot nights. The downside is our stay was the steep hill when walking up. But in all we had a great time here! God bless and thanks! A lovely week of peace and quiet. The breezes on the terrace helped the cold beer and iced wine go down even better. Urban was very helpful. We now move on to St. Marten! Leigh and Gaynor Tong, Holland. Hi Calypso. It�s the Haughtons and the Smithens again. Thanks once again. It�s our last night here, and we are so sad to leave. We have enjoyed 9 blissful days on the island, and especially here at Iris. The weather at home is still chilly, and we will miss the amazing view when we wake up and watch the sunset from our veranda. The pool is a wonderful treat after hiking up the hill, and one more we will miss! We would love to come back to visit again! Tomorrow we will leave Iris -- our home for the past month. We have thoroughly enjoyed our time here and shall dream about sitting on the verandah during the chilly New England days ahead. Next year we hope to come back for two months. We thoroughly enjoyed our stay here at Upper Calypso. The house was well appointed to support 2 couples. In addition to all the compliments in the previous entries we would like to restate the following: Spectacular view from the balcony! Perfect pool to beat the afternoon heat! Perfect verandah for enjoying the sunset and �the green flash�! This is the second time Toni & I have stayed in Nevis. I have surmised that: those people who tell you �the second trip to an island is never as good as the first�... have never been to Nevis. We had a wonderful week at Upper Calypso. We parasailed on Pinney Beach just south of 4 Seasons, and had several good dives starting at Scuba Safari (Oualie Beach). Coconut Grove was lovely, but seemingly overpriced for dinner. Ms. June�s was expensive at $85/person, but the four hour dining experience there was unique... The beaches at Nisbett, Pinney and Oualie were all terrific. the weather was lovely (1/5/07 - 1/14/07), and we had a splendid time. The pace here suited us better than the one in St. Kitts where we spent a day... All in all, a great time, and the villa was just right. Thanks. We are sad to be leaving this beautiful island and the 18 family members we were here with. We all enjoyed the beach, Nevis itself and our �Iris� home! A family reunion made really special by this amazing place. We all (ages 1-58) had a ball! We could write a book... but need to catch our plane. Thanks!! Thanks a lot to the hosts for letting us stay in such a beautiful place! I like the villas a lot and the paradise around. I met lots of interesting creatures here; my brother even bumped into a monkey on the stairway. Also, the beaches were great -- nothing burned me in the water or outside, which is rarely the case. 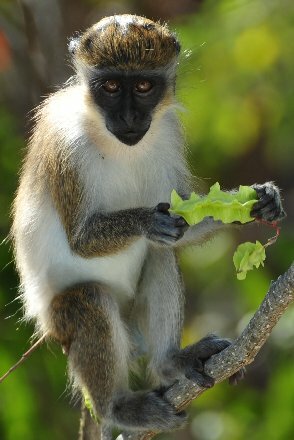 People in Nevis are so nice and seem to have a relaxed and fun lifestyle; I met lots of new friends! Also, the company here was great and it was fun to see everyone! What a wonderful place to vacation. We had a good family reunion coming from Wisc - Fla - Maryland - S Carolina and Nevis. Thanks, Calypso. The Dixon and Owens and the Ichneeder and Johnson families. Thank you Calypso for your protection for 4 wonderful weeks of sun, sea, and fresh food. We enjoyed our stay. Mr & Mrs Haughton and Mr & Mrs Smithen from: Birmingham, England. We came to Nevis for my brother�s wedding, which took place at Nisbett. Much of our party stayed at the Calypso and many family gatherings occurred here. I loved the view and enjoyed sitting on the porch any time of day or night. We even did yoga together one morning. It was wonderful to walk down to Oualie Beach. We got some exercise coming back up the hill. Snorkeling -- I saw the most fish and creatures past the point at Oualie Beach. We had better luck with clear waters early in the day. We also snorkeled at Nisbet, which had rougher water. Taxis -- Sydney Jeffers drove us a lot -- he�s great and also goes by Dr. Love. If you want a very wild ride, try the bus called "Buffalo Soldier" that passes by. Food -- Rumours has great punch; Sunshines is fun; Oualie Beach -- good food and people, great bar! We came to Nevis for my daughter�s wedding and were pleasantly surprised how beautiful it is here. We actually live on St. Croix, V.I., which is also beautiful, but there is something magical here. Our stay at calypso and iris was perfect for us. There were nine adults and five children and we were all comfortable. The views of the ocean and mountains and St. Kitts are breathtaking. The accommodations are very adequate and reasonable. Having a pool on premises was great. All said, our family had a great time, and if we ever come back to Nevis, we�ll try to stay at calypso and Iris. Thank you for sharing your home with us. Gary and Linda Surdyke and families. Normally we prefer to spend our winters at home in NYC in the snow, cold, and pollution, so it was tough to come to Nevis, with its turquoise waters, gentle breezes, and flawless sunsets. Throw in a beautiful house with fantastic views and you can imagine how we suffered! Still we�ll be back soon for another doze of hardship. The Magnusson Family, Stockholm, Sweden. What a beautiful spot! Came back to the villa for sunset every night. Highlights too many starting with breakfast on the veranda with a full rainbow!! Hiking Nevis Peak with ropes to help you up, the Source at Golden Rock climbing the ladder at the end to a special waterfall and coming back to a delicious lunch at the hotel and feeding their parrot french fries (his favorite). 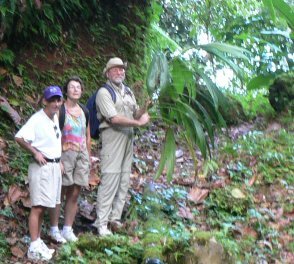 No one compares to Lynell and his knowledge of plants, and Nevis history hiking with him to Devil's Copper and Saddle Hill. A very special man with a lot of passion for Nevis. Beach and swimming - Lovers Beach, Pinney's and Nesbit. As far as the food - lots of choices: lunch - Sunshines, Beachcomber, Golden Rock, Hermitage, Nesbit Plantation; dinner - Miss June's, Bananas, Cla Cha Del, Tequila Sheila, Sunshines. Breakfast - buy your groceries at Tony's or Rams and eat on the veranda. Special note: Frederick and I couldn't find a place open X-Mas night and we drove by Miss June's and saw lots of cars. So we went in. Miss June was having her annual X-Mas party and she asked us to stay. It was a memorable night to say the least. I loved doing my yoga practice watching the sun go down. It was magical. We had a wonderful and restful week. I suggest renting a car (Jeeps and Suzukis are fun on the bumpy roads) since you have so much more freedom. Oualie Beach is great and the snorkeling by the rocks is fantastic (lots of lobsters, too). Windsurfing lessons with Roy were fun too! 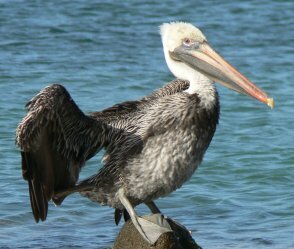 Pinney's Beach is great; you can watch the pelicans dive while you eat at Sunshines. For food Miss June's is fabulous and try the banana pudding at Bananas. Lunch at golden Rock Plantation was good but avoid the lobster sandwich unless you are a mayo freak. Four Seasons is really nice but expensive (stay away from the swordfish and kids buffet). If you go to St. Kitts, eat at Spratters which is only open for dinner, and Stonewall's. Yikes! 10 days passes so quickly in Paradise! We schemed daily for a way to make a living in West Indies and to make it a regular gig. But for now, we'll have to settle for the pictures and the memories. Nevis is such a wonderful island, and Calypso a delightful spot upon her. We've enjoyed most every moment. Ahh... Paradise found! The three musketeers of diving arrived cold and bone-weary from a year of hard work and a winter of early snowstorms. After soaking in the breathtaking view, gorgeous sun and amazing diving we are now rested, rejuvenated and ready to tackle 2001. The dive operation at Oualie was the highlight of our stay in the island paradise. Ellis, Rusty, and Deuce were all real professionals and superb at finding underwater wildlife. The time (10 days) has flown by... Time truly flows here in its own lilting way. Makes us wonder if we have overcomplicated and overbusied our lives back home... Thank you Nevis and Villa Calypso - we shall return! What an amazing place. We've enjoyed every day of living in this picture postcard. Villa Calypso is an ideal home away from home. The weather, the food, the rainbow, the friendly people - where do we start? Our suggestions: catamaran with Lennox, water taxi to Turtle Beach and have lobster salad while the monkeys entertain you (or vice versa), Lovers' Beach as often as you can, hike to the Source with Lynell from Golden Rock Plantation, and spend some time at the beach at Nisbet. That should keep you busy for a while! Best grocery store to shop at is Ram's on the far side of Charlestown. Avoid Everton the cab driver at Turtle Beach and make sure your rental car has good tires! We expect our warm memories of this paradise will keep us warm for the winter. Enjoy - Bev & Bobbie Allen. Four of us (Americans) spent a whole week in Upper Calypso, and enjoyed our stay very much. The house on the hill had all the comforts of home yet we were able to relax and forget the stress of life "back home". The view from the veranda is spectacular. Remote yet so close to so many activities. We windsurfed, mountain biked, snorkeled, kayaked, scuba dived, swam, hiked to the top of Nevis Peak, and toured the island. We did most of our own cooking but enjoyed a couple of dinners out in local restaurants. We didn't rent a car but we were able to get around nicely on bike, with taxis, and on the local bus. We hired T.C. to give us a 2.5 hour tour with a wealth of information. Also hired guide Jim Johnson with "Top to Bottom" to guide us to the Nevis Peak (5 hrs). Mom's Maxi Taxi was a safe cautious driver. We reluctantly leave today by the 1:15 ferry to spend a night on St. Kitts, and Tuesday return to reality. Thanks Pat for being a concerned and gracious host, and thanks Nevis for an extremely relaxing vacation. We've had a perfect holiday! tranquil, breezy, warm -- even the rain showers were gentle and brought double rainbows in their wake. What a glorious view! And the beach was perfect for swimming and exploring. The house is luxurious! We pitied people staying in the hotels while we enjoyed most of the amenities and had so much more space and quiet and privacy. We explored the island a bit every day and tried to arrange an event (more or less) every day. The nature walk at Golden Rock, a visit to Nisbet Plantation and Mount Nevis Hotel, a walk along Pinney's Beach, a snorkeling trip to St. Kitts, horseback riding, etc. We haven't seen or heard the news in a week and don't miss it at all. A complete otherworldly retreat like nothing we've experienced before. We hope to return! Thank you so much for making this vacation special! "maginificent" - this is the word we'd use to describe properly this spacious, luxirious, and cozy villa, with its big verandas and really gorgeous view of the sea, and especially our every day swimmings in the transaparant water, always calm and inviting. Here we have lost the count of days, being absolutely relaxed. Whenever possible, we will come here again. Thank you, Nevis! Thank you, Villa Calypso! P.S. Delicious freash fish any day! Free tennis "mixer" at the 4 Seasons on Tuesday afternoons. A hike to "The Source"
A little international cheer on Iris veranda.